Over the years, pizza has become an American staple and there is no shortage of authentic pizza parlors in and around US. 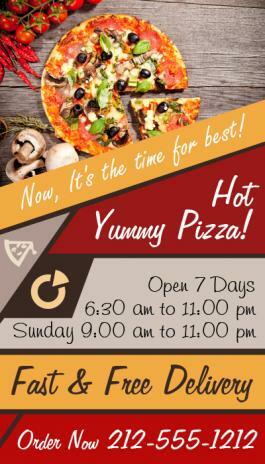 If you own such authentic parlor then these personalized 4x7 inch pizza magnetic cards square corner – 25 MIL are just the right promotional choice for you. Do you know why? Because it allows you large space to express your brand information, typical business information and comes with a certainty that your efforts are going to be taken seriously! Shipping, art set up and design – are offered for free on this magnet. Request a quote to know discounts that can be availed by bulk ordering these large custom 4x7 inch pizza magnetic cards square corner magnets – 25 MIL.